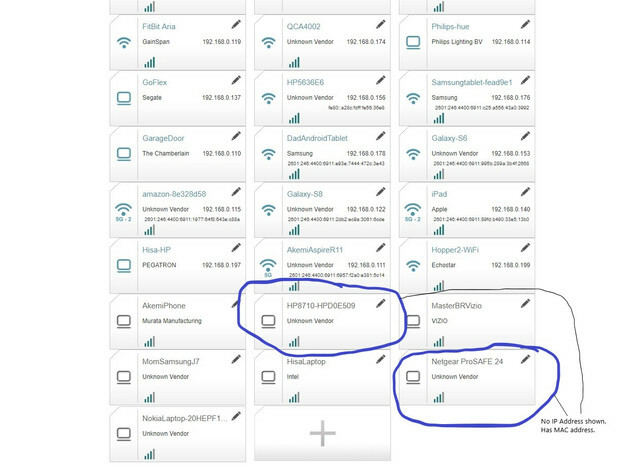 DIR-890L list of devices connected don't show IPs! I have devices copper connected as well as wireless. For some reason there are devices that will show the IP address (some even IPV6 as well), but there are others that show "UNKNOWN VENDOR" and no IP address! I know the devices are connected and working, example: Netgear ProSAFE Plus switch (JGS524Ev2) I have tried with that device both with a dynamic address from the dlink router, as well as a static address outside of my DHCP pool. Neither setting will show the vendor or the IP address for the switch. But I can see the MAC address if I click on the pencil. Now I can see if maybe Netgear decided to go with a newer vendor for their internal NIC on the switch that maybe D-Link doesn't have in their firmware, but not showing an IP address??? Even when the D-Link server itself GAVE the address to the switch??? Anyone have any ideas as to what might be causing this issue? Re: DIR-890L list of devices connected don't show IPs! Possible setting ont he switch that is effecting how the DIR router gets it's information from the switch. Might be a STP issue maybe. This would be something D-Link would need to review. You might contact NG support about this switch and ask them if there is any internal settings that would prevent product information and or IP address information from being collected by routers, NG or non NG router Mfrs. Also do you have another router that you can test with to see if that router sees the switch correctly or not? I’m in the Midwest of North America. I could see how you might think that it might be the switch, but then how do you explain the HP printer circled that is plugged directly into the d-link router? Or other devices that don’t show IPs? Also, if it was a Spanning Tree issue, wouldn’t there be other problems with communications? I contacted Netgear and they didn’t have anything in the switch that would deny the router the information needed to list manufacturer or IP. In fact they said they never heard of this issue before. I would suspect it’s the D-link router that doesn’t have the information needed to display manufacturer and IP. The strange thing is that when I click on the pencil next to the entry for this switch it actually list the MAC address. With that information alone it should automatically be able to know that this is a netgear product, so I don’t know why it says “unknown vendor”. I will pass this along to the router group. Not sure why this keeps happening. Does everything work OK on your network? This issue seems to keep appearing here and there for this router. I presume there is some form of handshaking issue going on with certain devices. DIR-890L will send ARP request every minute, and will add the client to the client list if it received an ARP response from the client. If it can’t receive ARP response from the connected client 3 times, router will remove it from client list. If the ARP response drops, this can cause incomplete info in the client list. Do you have QoS enabled? Try disabling it and see if the behavior continues. Use a different browser and make sure cache is cleared. Try connecting in incognito mode. Are the clients that have incomplete info connected to the netgear switch? Before I continue, I appreciate your responses. Thanks! GB, yes everything seems to be working fine on the network. maybe a little slow on the wireless performance, but either wise OK. Thanks for passing the issue to the router group. Furry, the HP printer does have a Hostname, if you see in the screenshot above it is listed as HP8710-HPD0E509. I just realized that this is an older printer that hasn't been connected in weeks (maybe months). There is no reservation on this printer so I don't know why its still on the connected clients list. In fact, that printer isn't even plugged in!!! GB, doesn't the ARP requests have to be sent to an IP? If the router is sending ARP requests to my switch, and getting the MAC address, why does my router not know the IP address that it just sent the ARP request to? I'm still confused as to how the router can give an IP to my switch (DHCP), then not know what IP it gave to the switch! Also, a few devices including the previously mentioned printer haven't been connected in a very long period of time and are still showing up in the client list. I tried Microsoft Edge/Chrome/Firefox on my PC as well as Safari/Chrome/Firefox on my iPad Air and Chrome on my Samsung Android tablet. All in both normal and incognito/private modes. I have now disconnected everything directly connected by copper to the router with the exception of 3 connections. 1 from my ISP, 1 to my Ooma phone device, and 1 to my Netgear switch. How do I clear the connected clients list so the router refreshes everything? I don't understand how there are devices on the list that have not connected in weeks/months? maybe a refresh would force the router to go back out there and see my switch properly? Make sure the FW on the printer is up to date as well. Set up a new Hostname on the printer before connecting it to the router maybe.